Following a rigorous inspection by our governing body, the Royal College of Veterinary Surgeons (RCVS) we’re pleased to announce that we have been accredited as a Small Animal General Practice with Core Standards. 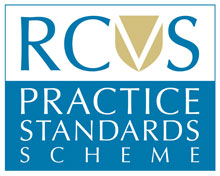 By setting these standards and carrying out regular inspections, the RCVS Scheme promotes and maintains the very highest level of veterinary care, bringing peace of mind to our clients, as well as giving you the choice to select the right care for you, and your pets! To gain the new accreditation, we had to volunteer for rigorous ongoing inspection in terms of our equipment and facilities; staff education levels; how we treat our patients and their owners; and even how we run the business… a lot of paperwork (!) but it is really nice to have it acknowledged that we are meeting more than just minimum standards. From hygiene, 24-hour emergency cover, staff training, and equipment we met all criteria. We are now proud to bear the logo which indicates that our practice has passed this rigorous, independent inspection and volunteers for random spot-checks throughout the future. It reflects really well on all the staff that we could have the inspector visit on a “normal” chaotic day – no red carpet! However everyone, especially Sue, put in a lot of work preparing files of documents. We hope this accreditation reflects how you find our practice- if you feel there are areas in which we can improve, please do let us know!